The starting point of this route is, again, Ademuz. However, if you are coming from the Cuenca province it can be started from the village of Torrebaja, and from Teruel it can be started in Villel, both on the N-330 road. From Ademuz, I take the N-330 heading towards Teruel. A good road if you are heading south, wide and with good tarmac, but heading north it quickly becomes a narrow country road that should be classed as a regional or even local road instead of a main route connecting Alicante with the French border. The 40km between Ademuz and Teruel are a bottleneck that sees heavy traffic of articulated trucks all year round, but environmental concerns about the Turia valley and, more importantly, the fact that this sparsely populated region has very little political weight have kept a better road from being built for decades. Halfway to Teruel I reach the village of Villel, where an even narrower road with worse tarmac leads to Camarena de la Sierra and the ski slopes of Javalambre. On the way there there are two more small villages and, just before reaching Camarena, the road goes through a narrow gorge where I find a small picnic area and a fountain with cool mountain water pouring out of a lot of taps. After a short stop I reach Camarena, where I leave the main road right after entering the village and take the TE-34 that goes to the lower car park in the ski slopes. Shortly after leaving the village, a sealed track starts to the right of the road and follows the Camarena river until reaching another picnic area. From this point, the track starts gaining altitude and becomes a dirt track after a couple of kilometres, but it is still good enough to allow the passage of regular cars without problems. This track ends in the Matahombres fountain, a picnic area with barbecues, a fountain and a pond, a nice spot, but usually rather crowded, particularly in summer, due both to the ease of access in all kinds of vehicles, as I said before, and to the natural beauty of the place, even though the use of the barbecues is forbidden in the hottest months. The circular route continues past the picnic area, but having reached this point it is worth taking a detour to the right and follow the ravine to visit the Amanaderos and the Yeguas waterfall. The surface on this track is a bit more broken, and even though it is not difficult to ride on, I would not take a family car on it. If the weather is dry there are no problems, but if it has been raining hard the usually dry ravine might carry water and complicate the crossing of a couple of spots. Shortly before reaching the end of the track, a road sign of the same kind used at the entrance of towns and villages informs me that I am in the Amanaderos. I park the bike as close as I can to the edge of the track to visit this part of the ravine, where water springs up suddenly from behind the rocks and quickly becomes a steady flow that a few hundred meters down the valley becomes the Yeguas waterfall. After crossing the river, this time with water flowing across the track, I reach a point where the track widens and is possible to park. Beyond this parking area I can see some wood fences that prevent the oblivious tourist from a serious fall down the Yeguas waterfall, the first of a series of waterfalls until the river reaches the Montereta mill, where the valley opens into an area of orchards belonging to the village of Riodeva. It is a very nice trek on foot, but if there is not another vehicle waiting at the end to take you back to the starting point you’ll need to walk six kilometres back up the river to the Yeguas waterfall. After admiring the waterfall from below, where it forms a pool where you can swim if you are brave enough to dip into the chilly water, I walk back to the motorbike and ride the track back up to the picnic area to continue with the route. The track gains some altitude from here on and crosses forests of pine trees, still with no difficulty if it is dry. 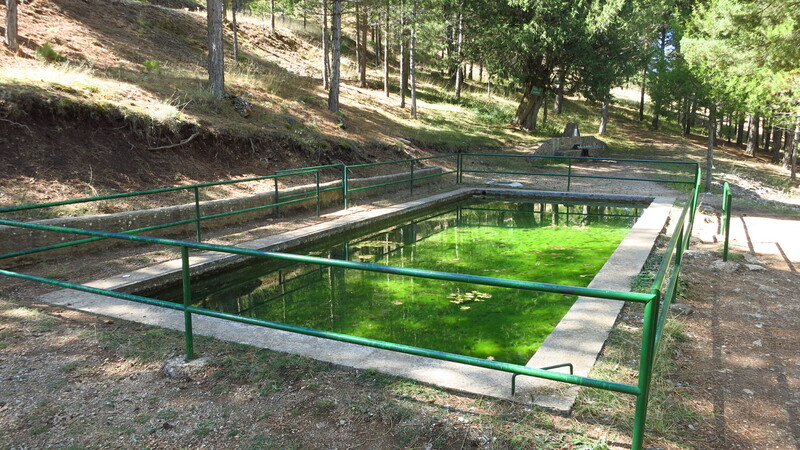 Shortly after, I reach Fuente de la Miel, where there is another picnic area, this one abandoned. From this point, the track takes me up the mountains until reaching a plain, Alto de Barracas, where it splits in two – both tracks lead to the village of La Puebla de San Miguel, the one on the left directly, the one on the right through Calderón peak and Vicente Tortajada pine, a centenary pine tree in a flora microreserve. I take the route to the right, and after making my way through a couple of tight downhill corners that the recent rain have made a bit tricky, the track goes round the south side of Calderón peak, the highest point of the region, and reaches another crossroads. To the right it goes back to Alto de Barracas round the north side of the peak, and to the right it goes past Gavilán peak, this one accessible by motorbike and 4×4, since there is a firefighting service surveillance tower at the top. Past this crossroads the road goes down the mountain fast, with some of the steepest segments paved in concrete, until reaching the last crossroads of the route. The plan was to head back to the road from here, as I am close to La Puebla de San Miguel, only one kilometre and a little down the valley, from where the road back to Ademuz through a couple of hamlets begins, but I see a sign that tells me that the track to the right goes to Mas del Olmo, the first of those two helmets. Wanting to stay off road for a bit more, I choose this option. This last segment has no difficulties either, it is a nice track that winds its way through terraces of almond trees cut into the mountain, trying to steal some lands for crops from the jagged mountains, a good reminder of how hard life must have been for our grandparents in this area. Once I reach Mas del Olmo the only thing left to do is follow the tarmac road back to Ademuz, my starting point. Ademuz – With a little over 1,000 inhabitants, this town is the capital of the enclave, built on the mountainside with a maze of narrow streets that confirm the Arab influence that its name hints to. At the top of the mountain stand the ruins of a castle, an old arab fortress called Al-Damus. From the entrance of the town a dirt track goes up the Pico Castro, a peak with excellent views over the town and its surroundings, including the river Turia. The shrine of Nuestra Señora de la Huerta, from the XIV century, is also worth a visit. The Amanaderos – This is the point where the Rambla de los Amanaderos, the stream that later becomes the Ríodeva river, springs up. 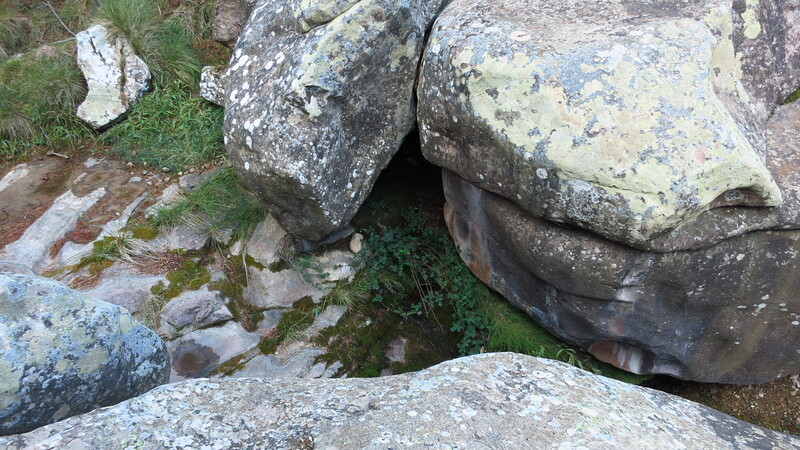 In this apparently dry part of the ravine water springs up from several places between the boulders. There is no place to park, but motorbike might be left as close to the edge of the track as possible to allow the passage of other vehicles. Alternatively, this spot can be reached on foot from the car park in the Yeguas waterfall, a short distance down the ravine. Yeguas waterfall and Ríodeva river trek – This waterfall is the first of the several that, together with a few natural pools, make up an interesting trek down the river until reaching the Montereta mill. If you have another vehicle waiting for you in Ríodeva it is possible to do the whole trek and enjoy the views of the waterfalls and the valley, if not, you’ll have to walk 6km back up from the mill. In any case, it is worth walking the first part to see the waterfalls. Puebla de San Miguel natural park – Part of the route goes through this park. Here you can find Calderón peak, the highest peak in the Comunidad Valenciana with a height of 1,837 metres. Reaching the top has zero difficulty, it is just a leisurely walk from Alto de Barracas. The park also has several flora microreserves, all of them signposted and with information panels. Shrine of La Puebla de San Miguel – If we take the route down to this village, the track joins the main road just past this good example of the typical shrine architecture in the region, with a porch over the front entrance. Casa Domingo, the main hotel in Ademuz, has bar and restaurant service. In Camarena de la Sierra, just after turning into the camino del Balneario, the road that takes us to the start of the off road part of the route, there is the Hotel Esmeralada. 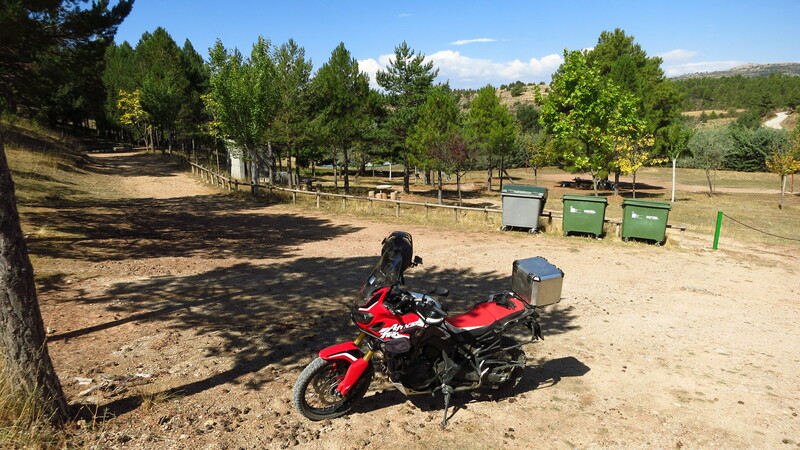 This entry was posted in Travel and tagged Ademuz, Amanaderos, Calderón peak, Fuente de la Miel, Honda CRF 1000L, Javalambre, off road, Puebla de San Miguel natural park, route by Kilian. Bookmark the permalink.